The Neogene Period began about 24 million years ago and it continues up to the present time. The name “Neogene” is a new name for part of the old Tertiary Period and includes the old Quaternary Period. Scientists changed the names of the periods when they learned new information about the age of the earth. The names will probably change again when scientists learn even more. Maybe you will help find a new and better way to name the periods of the earth’s history! The chart below shows the old names and the new ones. 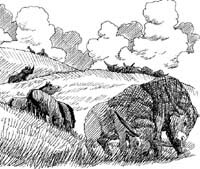 On this page, you will read about the Miocene and Pliocene Epochs in the Neogene period. The Pleistocene and Holocene Epochs are covered on a separate page covering the Quaternary Period. The Neogene Period was a time of big changes for the earth. The climate became cooler and drier. Grasslands replaced forests. The animals had to adapt to these changing conditions or face extinction. The Neogene Period was a time when the continents were crashing into each other. Mountains pushed up in many places. India continued its push into Asia. This created the Himalayan Mountain Range. Italy moved north into Europe raising the Alps. Spain crashed into France to form the Pyrenees. The Rocky Mountains and the Andes Mountains formed in North and South America during this time. Sea levels were lower due to the effects of continental collision. The North and South Poles began to have ice caps. During the Neogene Period, the polar ice thickened and took up more space in the ocean. The new mountains trapped water as snow and ice. All of this ice formation caused sea levels to drop even more. The drop in sea levels opened up land bridges between continents. This allowed animals to migrate between continents. South America moved to the north. By the Pliocene Epoch it merged with North America forming the Isthmus of Panama. Armadillos, porcupines, ground sloths and opossums migrated from South America to North America. Dogs, cats, bears, and horses from North America crossed into South America. The climate continued to cool. Many of the areas that had been covered by forests were changing to grasslands. Grasses were better suited to the cool dry weather. But grasses had less nutrition than the forest plants of the Paleogene Period. It took more effort to get the nutrients out. Grasses were made of chemicals that were hard on teeth. Chewing wore the teeth down. Animals that ate grasses needed stronger teeth. Changes in the plants meant that the animals had to adapt or die. Many of the forest dwellers became extinct and new animals developed that could live on the grasses. Horses had long, flat-topped teeth that were especially good at grinding the grasses. Their teeth grew longer and kept pushing up through their gums to keep up with the wear that came from chewing. Other animals developed new ways to digest the grasses inside their bodies. These animals had more than one stomach. They are called ruminants. They were efficient at getting nutrients from the grasses. This new type of animal, the artiodactyl, developed into many familiar species: camels, bison, sheep and giraffes, to name a few. New predators evolved for the grassland environments of the Neogene Period. The grazing animals could run fast. Predators had to adapt or go hungry. The sleek bodies of the dog and cat carnivores were able to run fast and use their powerful jaws and teeth to take down their prey. 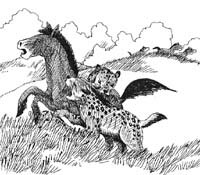 They became the dominant predators in the Miocene grasslands. There was new plant growth in the oceans, too. Kelp is a form of large brown algae. Kelp forests grew in cool waters where the plant could attach to rocks and coral. Otters and other animals evolved to live in this unique ecosystem. The dugong, a marine mammal related to the elephant and modern manatees, lived in large numbers in the Miocene kelp forests. Modern versions of these animals still feed on the plants in the Great Barrier Reef off the Australian coast. Sharks developed new species. One of these new sharks was Charcharodon Megalodon. It appeared first in the Miocene Epoch about 16 million years ago. Megalodon was the largest of all the sharks. It grew to be nearly 50 feet long! To feed its huge body Megalodon dined on whales and dugongs. Megalodon became extinct about 1.6 million years ago during the Pleistocene Epoch. The cooling climate of the Paleogene Period continued into the Neogene Period. By the end of the Pliocene Epoch the earth was locked in an Ice Age. There were many reasons that this happened. The lower sea levels, new mountains and shifting ocean currents all contributed. Ice caps grew over the polar regions. They stretched far beyond their present locations. Glaciers, growing from the ice caps, reached down as far as Ohio in the United States. The Pleistocene Epoch was beginning.